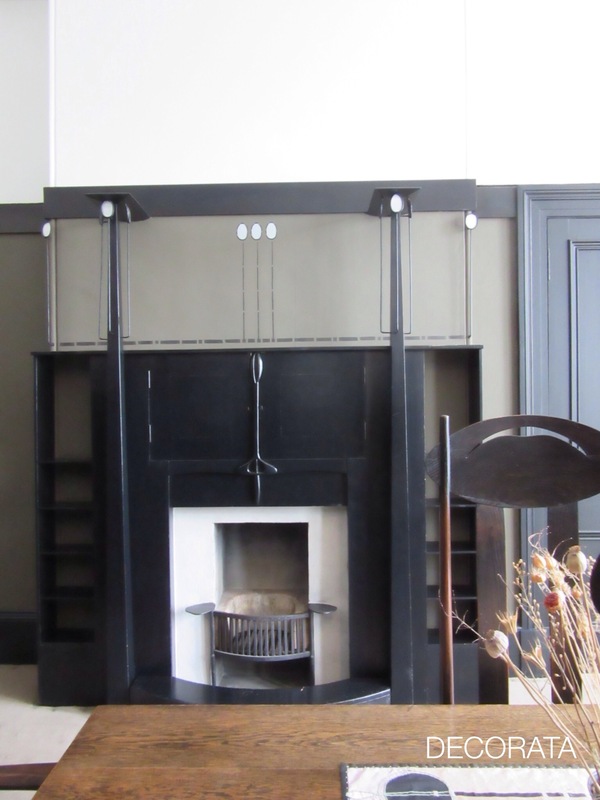 Ok, I was so excited I made the effort to see this Mackintosh House in the Hunterian Art Gallery at the University of Glasgow. 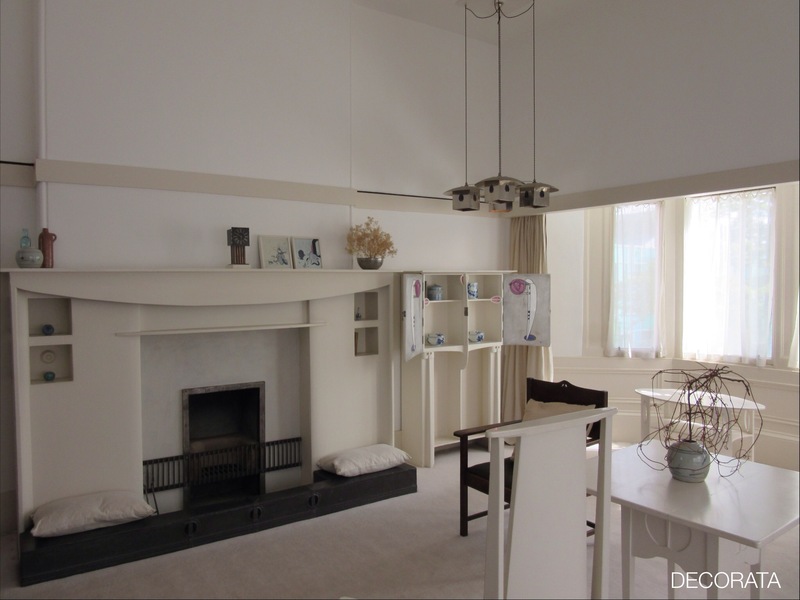 When I heard about of this I did know that the house, owned by architect/designer Charles Rennie Mackintosh (1868-1928) and his wife, artist/designer Margaret Macdonald Mackintosh, (1864-1933) had been reassembled as it had been while they lived there from 1906-1914. What I did not know it was strategically placed to be facing the exact direction and elevation so as the feel in the house is EXACTLY as they would have experienced it. The sense of space and light was wonderful to those of us that think about such things. They had completely renovated this Victorian home to suit their liking, removed walls, added windows, partially blocked a large bay window, remove ornamentation, used mainly neutral colours, – all very ahead of their time and completely opposite to what was fashionable. 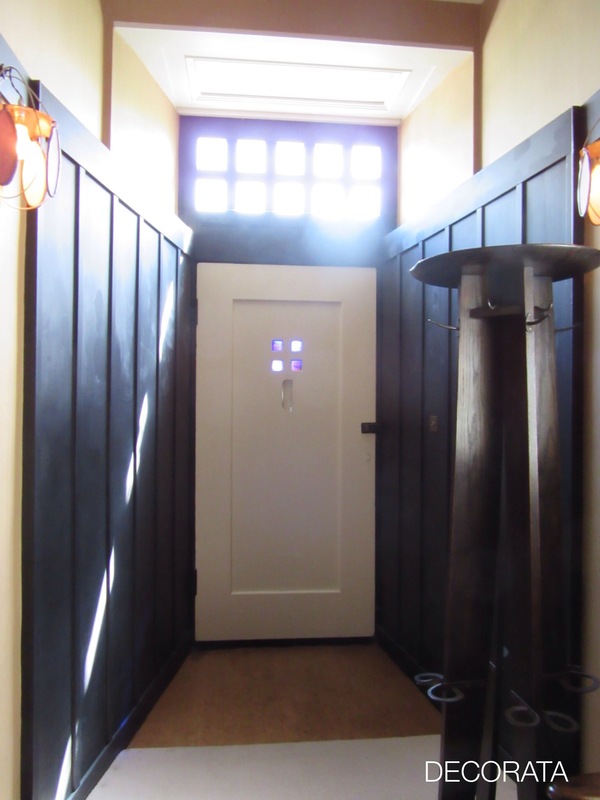 In the entrance, you can see the black panels installed on either side of the new door are at an angle and this was to visually expand the narrow space. The transom window above the door was added, as was the window on the side. This hammered metal mirror made by Margaret and her sister Frances, placed across from the window was to further bounce natural light in the space. Also hard to see, but there is a ramp to the front door, which would have previously been a step. The light fixtures and furniture are all custom made to their design. The dining room with dark walls that have been stencilled, is filled with more custom made furniture and lighting. The high-back style that he became known for, first made for Miss Cranston’s tea room. The fireplace was a major addition to the room. This sitting room studio and library on the second floor, was two rooms. A wall was removed, and you see by the bay window the ceiling is dropped. By contrast of the darker main floor, this is predominantly warm white, monochromatic. 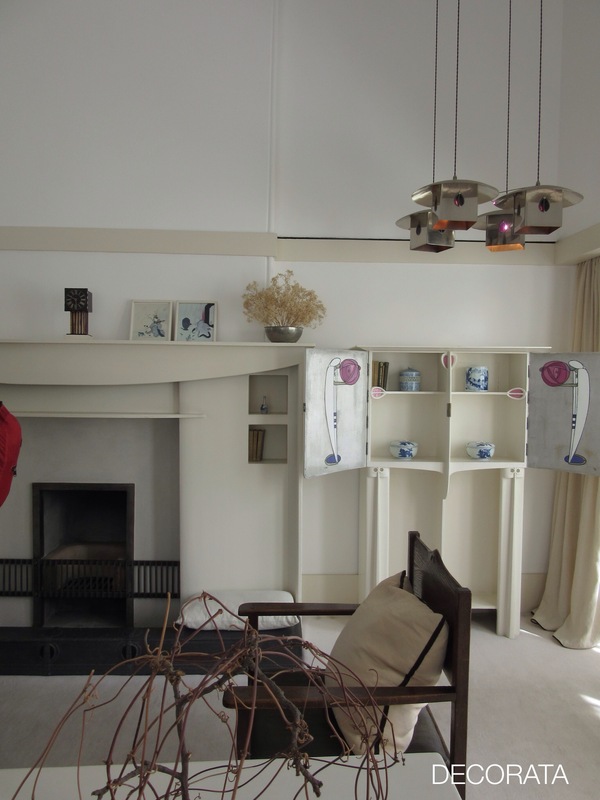 Rennie and Margaret’s distinctive style is easily recognized in the fireplace, the cabinetry and furniture. You may recognize this photo from my Facebook header. The quality of light was wonderful. 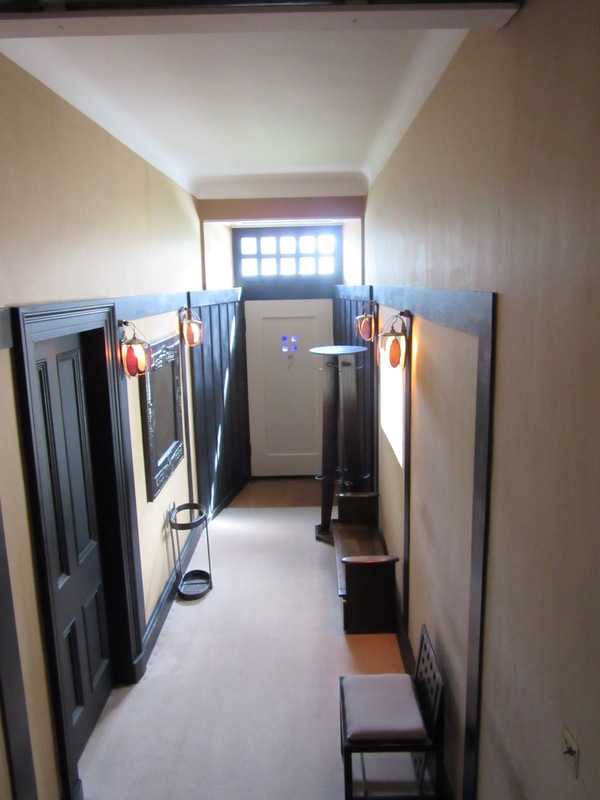 The company hired by the Hunterian Museum went to great lengths to recreate this home in the exact direction and elevation as its original location so that that visitors could experience exactly what the designers had achieved. Behind me a large horizontal window was added to the South wall which floods the room with light. Note the custom light fixture. 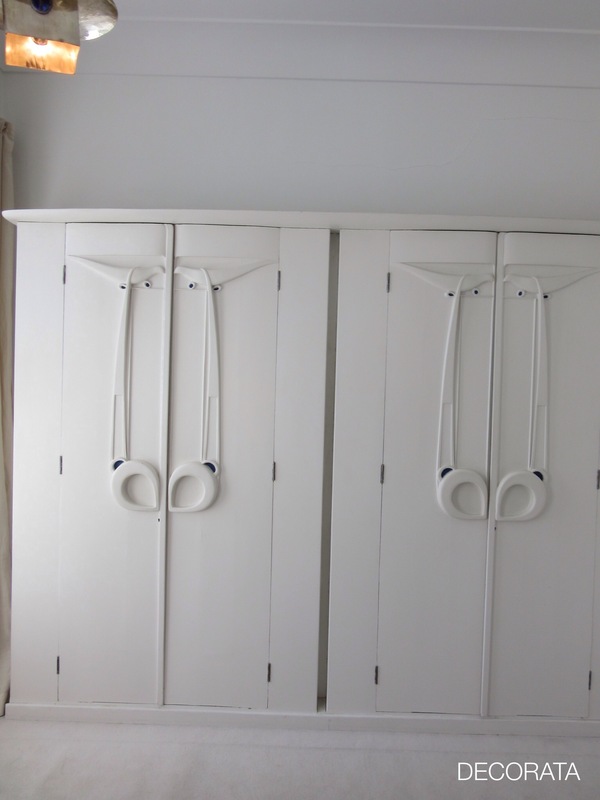 More custom designed and built furniture. Note the hammered metal accent that Margaret was known for. Built in bookcases at the other end of this room. Added stained glass detail such as this is distinctly MacIntosh + MacDonald. 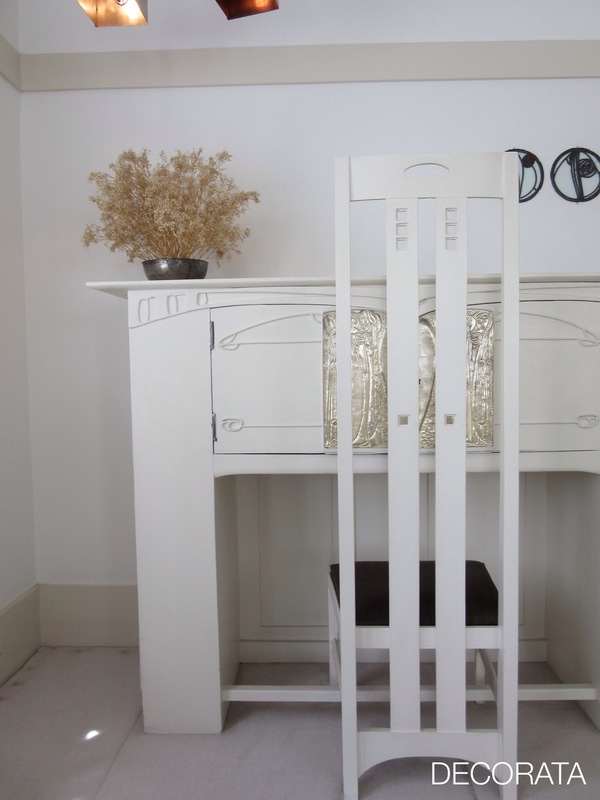 Bedroom – on the third floor, as they had done below, two rooms were made into one. Again painted in white, the natural light is wonderful. 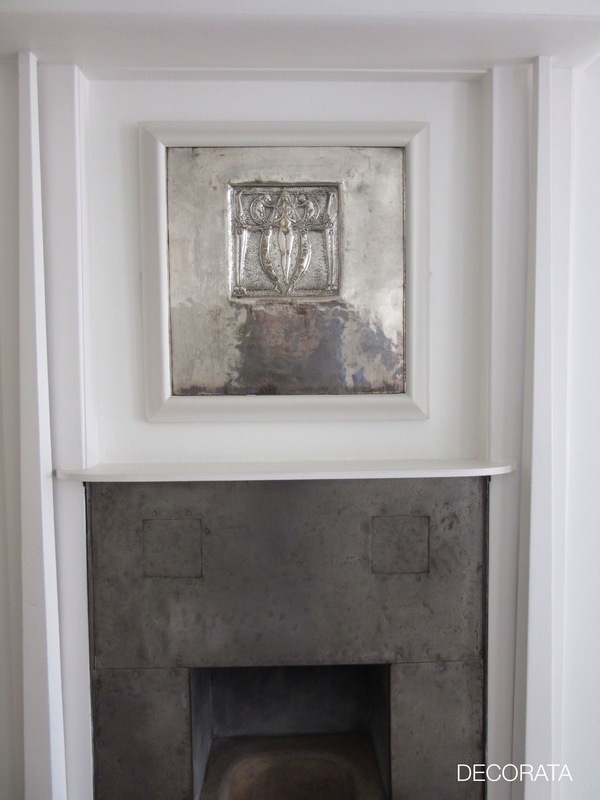 Another feature custom fireplace, the third in the home, featuring more of Margaret’s hammered metal panels. 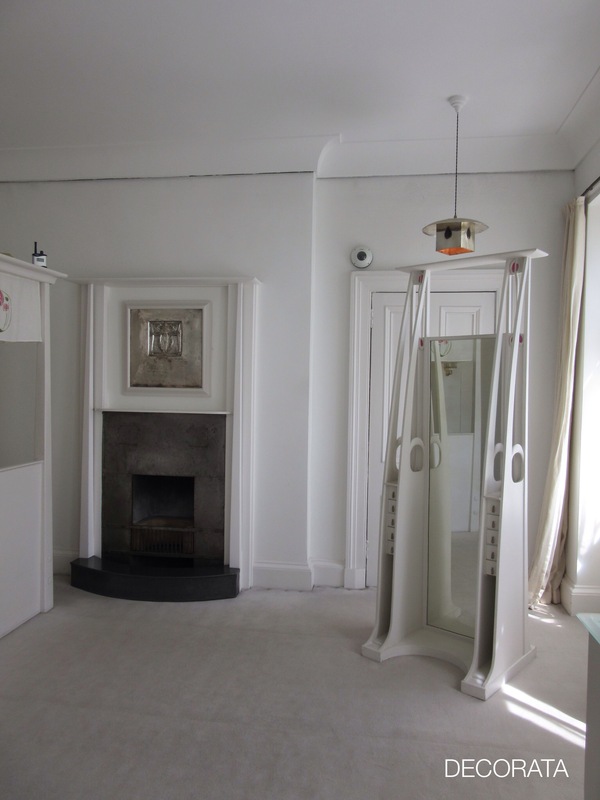 The Mackintosh House comprises the reassembled principal interiors from 78 Southpark Glasgow, the mid 19th century terraced house remodelled and lived in by Rennie Mackintosh and Margaret MacDonald Mackintosh from 1906-1914. 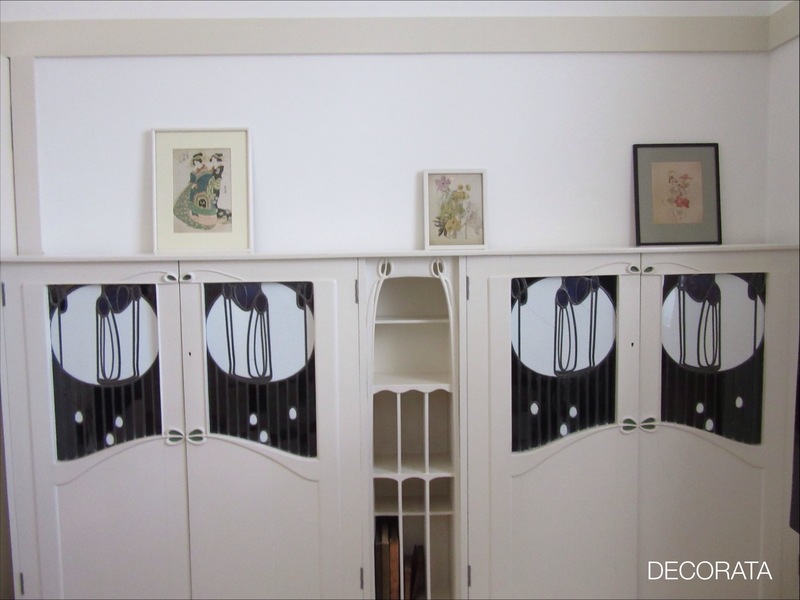 The original house was demolished in the early 60s, but the fixtures were preserved and reassembled complete with contents. Virtually the same views and effects of natural light are enjoyed as the original house stood only 100 m away. cloakroom, kitchen, bathroom, second bedroom are not reconstructed. 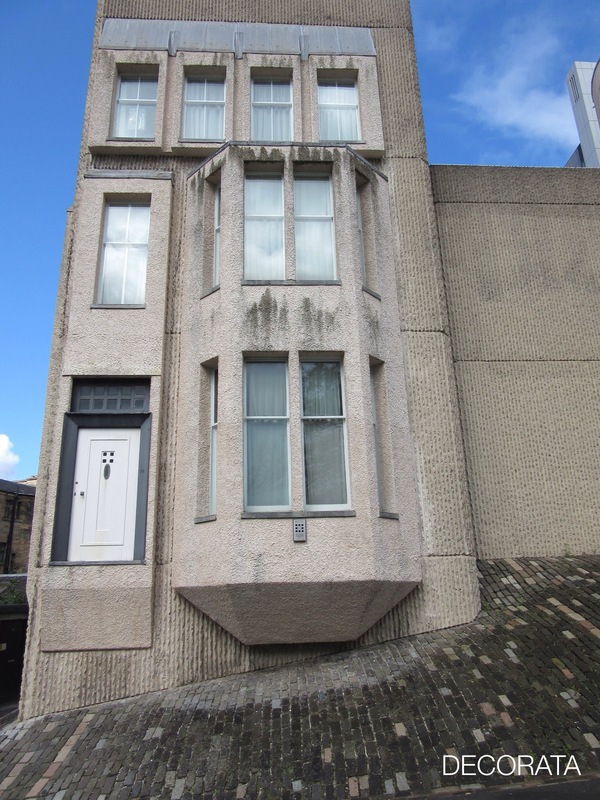 Here is the exterior, with the original door and windows inset the new structure, build in 1981. If you enjoyed this tour, which is a huge highlight of my travels, you may enjoy joining me on the Stately Homes and Architecture Tour in England May 2016. 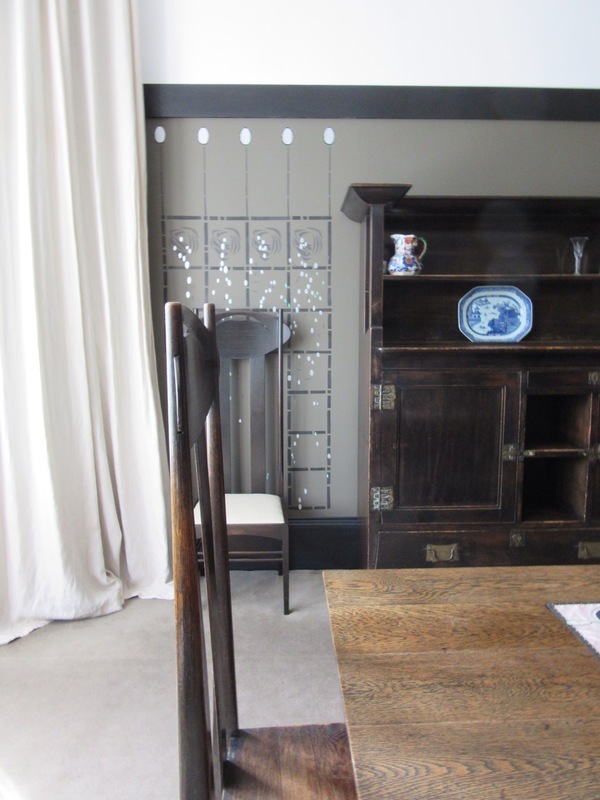 First stop is William Morris’ Red House, one he created and lived in, much like this Mackintosh house. 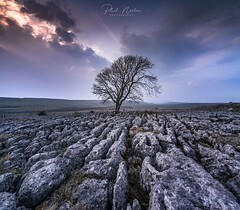 And we go to castles and cottages, spend two full days in Bath and attend the RHS Chelsea Flower Show. Small group (max 16) and Blue Badge Guide for entire trip. My name is Sue Womersley and I am an Interior Decorator on the Westcoast of Canada in White Rock BC. Thanks for reading!